Steve Jurvetson is a well-known venture capitalist and was a co-founder of the VC firm Draper Fisher Jurvetson (DFJ). Apparently, Jurvetson left DFJ last year, and Recode is reporting that he is starting a new firm called Future Ventures. Interestingly, the company is using the new gTLD domain name, Future.Ventures for its website. The Future Ventures brand name sounded familiar to me because the exact match .com domain name, FutureVentures.com, was sold on NameJet about 2.5 months ago. I liked the name enough to bid $777 for it, but FutureVentures.com ended up selling for $1,009. There were 37 bidders who participated in the expiry auction. Afternic emailed its customers yesterday to let them know they could now more easily set up landing pages without pay per click (PPC) links on them. These types of “for sale” landing pages make it more obvious that a particular domain name is for sale rather than having a smaller “for sale” notice on them. 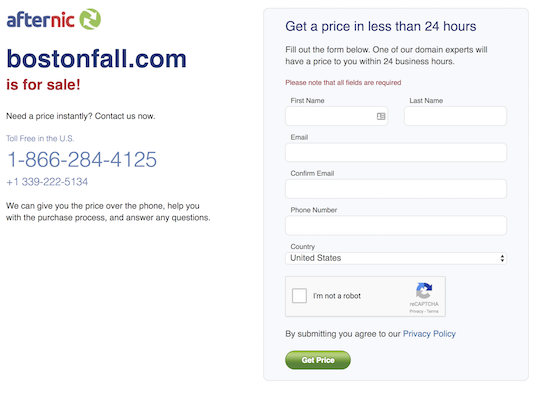 These landing pages give visitors the option to call a toll free number to speak with an Afternic sales representative, or they can fill out an inquiry form. The asking price is not listed on the landing page. Prior to yesterday’s news, customer were able to forward their domain names to this type of landing page, but it took more effort setting up forwarding for each domain name. This nameserver change option will allow users to set this up in bulk. Daily Poll: Do You Sell Domain Names via Afternic? It’s not every day that I watch a video related to the domain industry and learn from it. Yesterday, I shared the Paul Nicks keynote speech at NamesCon, and it was well worth my time. If you sell domain names via Afternic, I strongly recommend you watch it when you have time. It gives a great overview about how GoDaddy prices and sells domain names from its NameFind portfolio. Having said that, I am curious if you use Afternic to sell your domain names. I have quite a few of my names listed for sale there and I am curious if others do as well. Participate in the poll below and feel free to share your thoughts about using Afternic if you would like. Do You Sell via Afternic?